Chimney Fire - What is it like? Chimney fire – what happens? Chimney fires are no fun. You’re sitting in front of your fireplace on nice nippy afternoon. You are with the family, watching a football game, playing a board game, or possibly discussing the relative merits of particle physics……you get the picture. You start to hear a continuous whoosh, or maybe even a “roaring” noise. It takes a moment for you to figure out that it’s coming from the fireplace. Just then the phone rings. It’s your neighbor. 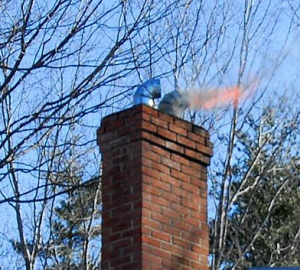 They ask , “Are flames supposed to be shooting out of your chimney?” (Yes, this really happens.) After everyone runs around the room screaming for a bit, you might decide to get out of the house. Outside you are treated to a show that you can’t even see at Disneyworld. But before we get to that, let’s step back in time so we can understand how this chimney fire came to happen. Start with a dirty chimney. How does the chimney get dirty? We’re glad you asked. When you burn wood in a chimney, the fire, the wood, and the moisture in the wood combine to create a lot of new chemicals. The technical term we Atlanta Chimney Sweep Pros use is “smoke and soot”. The smoke contains “creosote” (look it up if you’re the scientific type). Some of the creosote sticks to the walls of the flue pipe on the way out of the chimney. (The flue is the pipe that runs to the top of the chimney from where you have the fire in the fireplace. The Damper is the little door that is above your firebox that you open and close. OK, got it? The “Flue” is the pipe, the “damper” is the door.) No creosote, no chimney fire. After burning some fires for a year or two, your flue pipe gets coated with creosote. Creosote gets more flammable the longer it is in the chimney. So one day you may have a fire going just like every other fire, but that is the day the creosote reaches the right temperature and BAM! Chimney Fireworks. Once creosote gets going, it burns with merry abandon. To burn, the chimney fire must pull oxygen from the room, up the chimney. The more it burns, the more air it needs. That’s why it sounds like a jet engine when it really gets going….because at that moment it basically is a jet engine. Here’s the Disneyworld theme part. Call it “World of Home Volcanoes”…..just go to the Chimney Fire section. A chimney fire can go from 400 degree F. to over 2000 degrees in under a minute. And here’s where the fireworks show can come in. In a brick/mortar chimney, the fire can be so hot, it melts the mortar between the joints of the bricks. The jet flame updraft then shoots the flaming little lava balls into the air and onto the surrounding countryside, including your roof. In addition, you could see a flame “tongue” 15 to 20 feet long coming out of the chimney. If the wind is blowing the wrong way, that flame “tongue” will lay down across your roof. If it does that for very long it can light parts of your house on fire that aren’t even connected to the chimney. If you are lucky, the fire might make the chimney crumble away from the house. If not, well………. If you’re the intrepid type, you can stand your ground and try to fight the chimney fire. Here’s what to do until the Fire Department arrives. Douse the fire in the fireplace as quickly as you can. Wood burning pros will actually keep a bucket of sand nearby for the occasion. (Water also works, but will make lots of steam, smoke, and mess on the floor.) Then try to cut off the air going up the chimney. If you have glass doors on the front, close them. If you don’t have glass doors, then you can wet a blanket and hold it over the front. The last resort is to close the damper, but ONLY IF YOU HAVE PUT OUT THE FIRE in the fireplace! Note that this doesn’t work if your damper is at the top of the chimney, rather than right above the fireplace. If you close the damper, any smoke still coming from the fireplace you just smothered will come into the house. Still, this method will really put a “damper” on the party that fire is having in your chimney (get it? Damper? On the party? OK, bad joke). So you have to decide if you want some temporary smoke in the house in exchange for a more sure put-out of the chimney fire. The chimney fire draws all of it’s oxygen through the fireplace, from the bottom upward. Blocking the air with a wet blanket at the front of the fireplace may not put the chimney fire out completely, but it will still help a lot. If the chimney fire has less air it will burn slower and cooler. If your chimney gets up to 1,000 degrees during the fire it will be fine. If it gets to 2,100 degrees, it might not be doing too well. It may damage it to the point there are major repairs needed. Remember, it will all be over in 3-5 minutes usually, so whatever you do, you have to move fast. So what have we learned class? You can try to figure out exactly when your chimney needs cleaning. All you have to do is calculate the airflow co-efficient of your chimney, multiplied by number of fires x size of fires x length of time each fire burns, divided by creosote potential of wood type, added to wood moisture density over time calculations, subtracting the chances of some kid/relative throwing a bunch of pine cones or Christmas wrappers on the fire at exactly the wrong moment……or…..
You can just call us to get your chimney cleaned and inspected regularly. Chimney fires are nothing to play with. Take care of it Today!